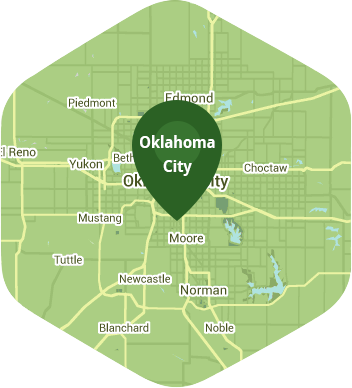 Book a skilled lawn pro in Midwest City. Backed by a total satisfaction guarantee and amazing customer support. You live in Midwest City because while you enjoy all that living in Oklahoma City has to offer, you also enjoy the feeling of not living in a large city at all. Wide open spaces and blue skies make Midwest City not only a beautiful place to live but a relaxing one. So why not spend your free time relaxing and taking in the beauty of Oklahoma, rather than toiling in your lawn just to keep the grass mowed? The good news is that you don't have to because Lawn Love is here to make things easier. Lawn Love is a fully bonded and insured lawn care company. Our team of highly skilled and experienced lawn care technicians can take care of the less glamorous aspects of lawn care. Leave the mowing, seeding, weeding, trimming and aerating to us – all you have to do is give us a call. To get started, simply all Lawn Love at 405-926-8318 to get your free, fast and easy two-minute quote today! Rated 4.75 / 5 stars in 3,720 Midwest City customer reviews. There won't be any rain in Midwest City today, which means you'll probably have to water your lawn. Dusk and dawn are the best times to water your lawn (the sun will rise at 6:46 AM and set at 8:10 PM today in Midwest City). Here are some average lawn care prices for homes in Midwest City. Average lawn size 4,799 sq. ft.